Tooele enjoyed their first post-season playoff victory in quite awhile Friday. The Buffs produced a hard fought 55-51 triumph over Granite to eliminate the Farmers and boost the local team into the Class 3A State Boys Basketball quarterfinals for the first time in years. Not too shabby for a team picked to finish fifth in their own league, let alone become one of the eight teams remaining in the classification. Although Tooele has far exceeded expectations by many so-called boys hoop experts, Buff Coach Gary Alverson said his team should not settle for just being glad to finally get to the big dance. 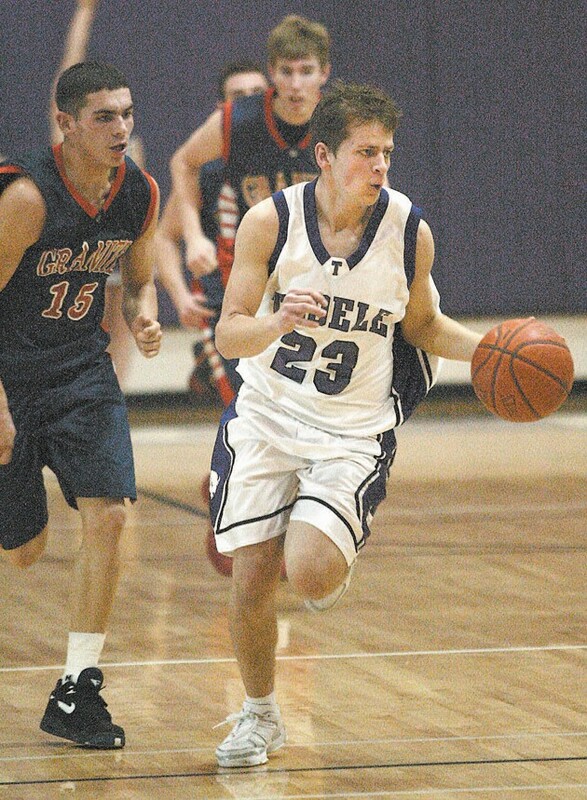 Tooele is set to tangle with Dixie today at 2:30 p.m. in the state quarterfinals at the E-Center in West Valley City. The Flyers became the first team in three years to post a 3A road playoff victory when Dixie upset favored Emery 54-51 Friday in Castledale. Now, Coach Alverson is hoping his team can seize the moment and cherish a possible favorable match-up against a team that had lost as many games at the Buffs had this season, eight, and sport one less victory on the year at 13-8. Tooele sports a 14-8 overall record on the season headed into the quarterfinal bout. Tickets to the state tournament games are $4 for students pre-sale, $5 for students and senior citizens, and $6 for adults. Coach Alverson said his Buffs must relish the challenge and not settle for just being happy to make the tournament. “Now we play a big team,” he noted. “They are the only team in the Class 3A in the last three years to win on the road. That is a big win for them. Now we have to strap it up and see if we can get the next game. They have two very good wing players, averaging 14 points per game and they are very athletic. They have some good senior players that are physical. 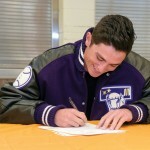 When it counted, the Buffs’ philosophy of sum of a complete team is greater than or equal to a squad with a pair of strong players proved to be beneficial for Tooele Friday at THS. 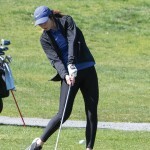 The local squad parlayed key offensive and defensive contributions from five different players down the stretch to pull away from the determined Farmers and register a hard fought playoff victory. 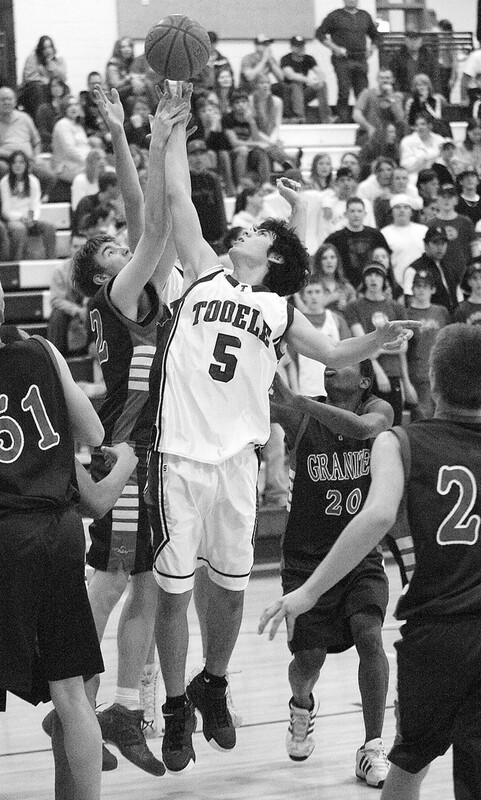 The game was a see-saw affair the entire evening as the lead changed hands 14 times and the biggest lead by either team was four points until Tooele grabbed a six-point cushion with 2:35 left in the contest for the largest margin of the night. Tooele was poised down the stretch of the playoff victory thanks to playing a pair of close and come-from-behind victories the week before and laid a solid foundation for the Buffs character in a hard fought postseason battle with the Farmers. 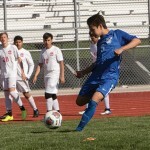 The local squad rallied from sixpoint deficits last week against Ben Lomond and Bear River to register pivotal victories to enable Tooele to win a coin flip and host Granite in the state playoff. The Buffs upended the Scots 39-38 Feb. 9 at home and then recorded an overtime victory at Tremonton over region rival Bear River Feb. 11 to forge into a second place tie with Ben Lomond at 7-3 in region action. The Buffs’ scoring balance and team effort theory paid big dividends early for the hosts. Tooele had five different players produce points in the opening session of the game and stake them to a 12-9 lead after eight minutes had expired. Nash Lockie spearheaded the early surge with five points and Josh Boucher buried a three-point bomb. Colton Hogan contributed a basket while Taylor Palmer and Mike Holt chipped in with a charity toss each. Cory Waddoups led the way for the visitors with five points, including a 3-point bomb, while Anthony Lintz and Travis Page countered with a basket each. Granite battled back to tie the game at 15-15 on baskets from Page and Andy Swanger and a pair of free throws from Waddoups. After a Lockie free throw, Granite’s Waddoups buried a 3- point bomb to stake the Farmers to a brief 18-16 edge and still 4:08 left in the first-half. But Tooele countered with a Castle steal and pass to Holt, who in turn fired a pass to Lockie for a fastbreak layup to tie the game. Castle then hit Lockie with another stellar pass and the Buffs had a slim 20-18 edge. Swanger hit a layup in the waning seconds of the period to force the game into a 20-20 deadlock at the halftime break. Hogan opened the third period with a rebound basket but Granite answered with six unanswered points to grab a fourpoint lead, 26-22. Keith Williams ignited the Farmer attack with a pair of jumpers and LIntz put in a rebound basket to trigger the comeback bid. Lockie answered for Tooele with a free throw and rebound basket to close the deficit to 27-26. The two teams would trade baskets and points the remainder of the way until the Buffs took a one-point lead into the final frame of the game. Holt and Boucher produced four points each during the 15-13 surge while Lockie chipped in with a pair of free throws and Palmer and Hogan added one each. But the biggest basket of the period came when Lockie grabbed an offensive rebound and Castle buried a 3-point bomb with 2.5 ticks left in the quarter to erase a 40-38 Granite advantage. Williams kept the Farmers in the game during the stretch with six points while Waddoups followed with a layup and 3-point shot. If Castle didn’t hit a big enough shot to culminate the key third period stretch, Lockie gave Tooele a big boost with a layup to open the final frame and stake Tooele to a lead it would never relinquish the rest of the way. Palmer canned three of four free throws and Castle took a feed from Holt and buried a 10- foot baseline shot to stake the Buffs to a 48-44 cushion and 4:09 left in the affair. Palmer, Lockie and Hogan worked the fastbreak to perfection for another field goal to extend the margin to six points and only 2:35 left in the game. Although Swanger canned a pair of charity tosses and Waddoups fired in another 3- point bomb, Granite could not overtake the determined Buffs down the stretch. Palmer produced five of his seven points for the night in the final frame while teammates Hogan, Holt, Lockie and Castle all scored points in the fourth period to vault Tooele to the post-season triumph. Lockie led the Buffs with a team high 17 and Hogan fired in 10. Holt and Boucher contributed eight each and Palmer hit for seven. Cory Waddoups poured in a game high 20 and Travis Page netted 11 to lead Granite on offense.goal to aid the effort.